This article is published in collaboration with Mail & Guardian Africa. A GREAT opportunity lies in reach for Africa’s leaders at the Paris climate conference (COP21). That opportunity is a strong international climate change agreement, benefiting developed and developing countries, rich and poor, North and South. The leaders do not expect all the world’s problems to be resolved at these talks. And yet they recognise that now is the time to think and act boldly and creatively. The story of the grave threats Africa faces from climate change is well known. A warming climate and more uncertain rainfall threaten our agriculture. Rising seas imperil our coastal and delta cities. Higher temperatures will exacerbate disease and ill-health. And poorer countries have fewer of the resources needed to adapt to these impacts. The countries of Africa have done little to create the threats that climate change brings. The continent is responsible for a tiny fraction of the greenhouse gas emissions that are warming the atmosphere and the oceans. This historical unfairness has encouraged Africa, alongside most of the developing world, to bring a justified sense of grievance to the climate change talks. African negotiators have insisted that the rich world must bear responsibility for reducing emissions, and bear the costs of helping the developing world adapt to the effects of climate change. But this fault line between rich countries and developing world is coming down; a different tack is needed to forge a strong climate deal in Paris that is in the interests of all countries. This tactical shift is being adopted by a growing number of countries in the developing world. They remain committed to the spirit behind “common but differentiated responsibilities” – as evidenced by the recent emphasis on “loss and damage”. At the same time, many recognise that they can avoid the pitfalls of the early industrialisers by blazing a new low-carbon trail that will advance, rather than stymie, progress. Many of Africa’s leaders recognise that tackling climate change presents an opportunity, rather than a cost – one that can help their countries develop along an economically, socially and environmentally sustainable path. 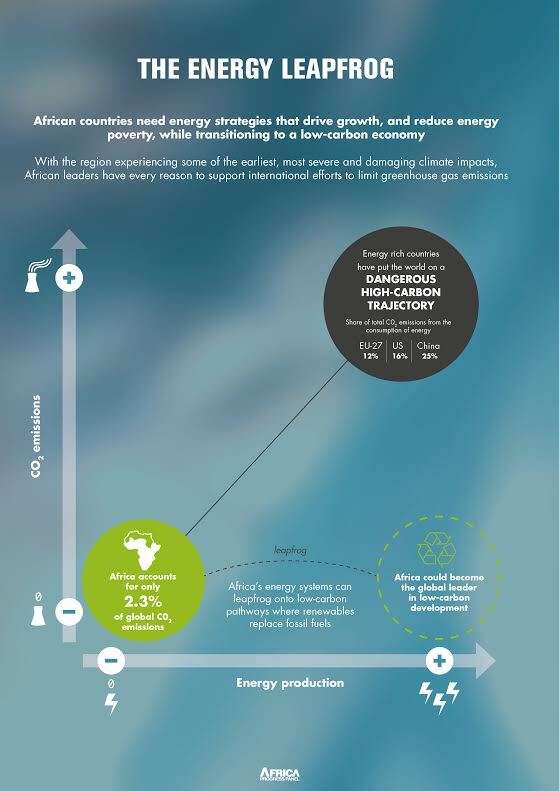 An ambitious climate change agreement could help Africa seize that opportunity by addressing one of the continent’s most pressing problems; its huge energy deficit. As the recent report from the Africa Progress Panel (pdf), chaired by Kofi Annan, highlighted, two-thirds of Africans live in households without access to electricity. At the same time, the continent is rich in the renewable resources that can help to eliminate energy poverty. To achieve universal access to electricity in Africa, investment of $55 billion per year is required until 2030. Climate finance, unlocked by a strong global climate agreement, could provide part of the capital required. Governments across Africa also need to make bold domestic commitments to renewable energy and low-carbon development. A strong climate agreement will provide encouragement for international investors to seek out opportunities to fund low-carbon development around the world. But what will drive individual decisions to invest will be decisions taken by African governments to establish domestic targets, policies and regulations, as set out in countries’ submissions as part of the international climate process. The business case to support these investments is compelling. Demand for electricity is so strong that some of the world’s poorest people are prepared to pay some of the world’s highest prices for power; a villager in northern Nigeria pays around 60-80 times as much for a unit of electricity than a resident of London or New York. Millions of energy-poor, disconnected Africans earning less than $2.50 a day already constitute an energy market worth $10 billion a year. Renewable energy also offers clear advantages over grid-connected, fossil fuel-fired power. Distributed, small-scale renewable energy can rapidly deliver the social and economic advantages of electrification to rural communities, helping improve public health, enabling access to education, and opening up economic possibilities to a continent of entrepreneurs. And this is taking place in a context of rapidly declining prices for renewable energy. The cost of generating power from renewable sources has fallen by 65% over the last three years. An ambitious climate change agreement will help African leapfrog over the high-carbon modes of development that have led to so much pollution and waste in other parts of the world. Countries like Ethiopia, Kenya, Rwanda and South Africa are emerging as frontrunners in the global transition to low carbon energy, and others are poised to follow in their footsteps. Africa’s leaders must now seize the opportunity presented by the prospect of a strong climate change deal in Paris. They must negotiate in the interests of all countries. Developed countries must continue to provide the financial, technological and capacity-building resources required to help poorer countries mitigate and adapt to climate change. And the rich world must agree to aggressively reduce its own greenhouse gas emissions as an urgent priority. The commitment of many African countries to a low-carbon, post-fossil fuel trajectory is not in doubt. It remains to be seen whether this pivot, away from a “polluter pays” blame-game, towards a new paradigm of climate opportunity, will be matched in ambition by the rich countries. What is clear is that Paris is not the be-all and end-all – what it provides is a powerful springboard for African countries to capitalise on the opportunities at hand. Author: Olusegun Obasanjo is a former president of Nigeria and Panel Member, Africa Progress Panel. Image: A woman fetches drinking water from a well along a dry river. REUTERS/Philimon Bulawayo.